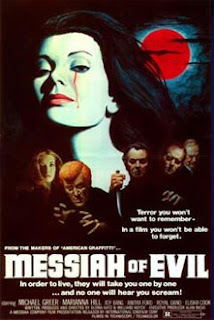 I initially saw ‘Messiah of Evil’ as part of one of those super cheap, twenty movies for $10 sets that Brentwood was cranking out with regularity. The movies are all public domain, usually sourced from video cassette, and almost without fail, pretty bad. So, naturally Mrs. Outpost Zeta and I own about a dozen of them. To say I went in to this film with zero expectations was an understatement; usually you’re lucky if the film isn’t just a muddy brown mess with garbled sound. So when I encountered a film that was actually atmospheric and dare I say, very eerie, I was more than a little shocked. Mariana Hill plays Arriety, a young woman how has come to a small seaside town looking for her father. Her dad is an artist, who had gone missing some time ago. She receives several warnings to leave town as soon as possible, which of course she ignores. She’s told by a homeless man, if she meets her father she needs to kill him and burn the body. A man dressed in white, Joseph Long (Royal Dano), along with two women, Toni (Joy Bang) and Laura (Anitra Ford) more or less, move into her father’s house against Arriety's will and slowly they all uncover an old curse of someone or something that is going to return from the sea and end the world. If the previous plot synopsis doesn’t make a whole lot of sense, that’s because the story is presented in such a drifting dreamlike manner. The town feels half abandoned; characters stare off horrified at unseen things. The film does a fantastic job of just giving you the very edges of something huge and terrible descending on the town and that is when it works the best. There are some missteps in the film, such as a prologue that doesn’t seem to fit with the rest of the movie involving a man looking for help and running into the wrong little girl. Also, I could have done without the voice overs, but I can say that about 99% of voice overs. There are a couple of excellent set pieces, including the locals helping themselves to some raw meat in a grocery store and Toni watching a noisy western in a theater, unaware that the seats behind her are slowly filling up with townspeople who are much more interested in her than the film. Thankfully, Code Red put out a much cleaner widescreen version of the movie and it looks great. The mostly muted color pallet and deep black shadows add to the sense of dread that permeates the entire story. When bright colors appear they are shocking and garish, the artist’s house is a particularly good mix of both all these elements. It is pretty amazing that this movie doesn’t really get spoken about more often, especially in the wake of Lovecraftian tales of cosmic doom becoming so popular lately. Messiah of Evil definitely captures that flavor. The low quality version is available online as well as those cheapie sets, but I’d spring for the Code Red version if you have the cash to spare. Thank you for letting us know about this little gem. I'll have to source it down! Sure thing, let me know what you think of it, when you finally get a chance to see it. Hey, don't know if you noticed this, but Huyck / Katz are a husband and wife team that also wrote for American Graffiti and Temple of Doom for George Lucas, and Huyck even directed the much-maligned Howard The Duck. Haven't seen Messiah of Evil yet, alas, but eventually . . . .